Technorati has just published its annual report, State of the Blogosphere 2008. As usual, it makes interesting reading, especially for those of us interested in business blogging. The report is being published over five days – here are some of the highlights from the first two. The report shows that Technorati has indexed 133 million blogs since 2002. 1.5million blogs have been updated in the last 7 days and 7.4 million in the last 120 days. These figures still support my argument in the first chapter of my book that business bloggers should not be put off by the total number of blogs out there because, in fact, only a small proportion are active. It’s interesting to note that the majority of bloggers now display advertising. 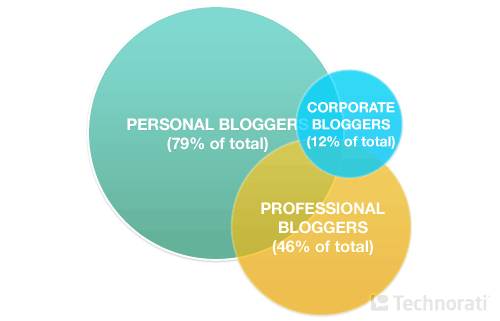 “More than half of professional and corporate bloggers are also personal bloggers. This could be on a separate blog, or they may blog about personal interests within their professional blog. It’s very encouraging to see the positive benefits being enjoyed by business and professional bloggers, with the majority of those surveyed reporting a positive impact as a result of their blog. Half of them say they are better known in their industry and a quarter see their blog as a useful resume enhancement. Business bloggers also report that blogging has brought many unique opportunities that wouldn’t have otherwise been available. Taking part in an event, contributing to a print publication or even appearing on radio or TV are the kinds of things they are involved in, thanks to their blog. Have you been invited to any of the following as the result of your blog? From what I have seen so far, the State of the Blogosphere is looking good for business and professional bloggers. I’ll be blogging about the next three days of the report when they have all been published. Days 4 and 5, which examine blogging for profit, and brands entering the blogosphere, look particularly interesting.